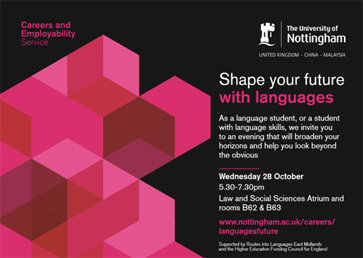 Last month, the University of Nottingham hosted a careers event funded by Routes in Languages East Midlands and the Higher Education Funding Council for England (HEFCE) to inspire languages students and offer alternatives to “obvious” careers such as teaching or translation. 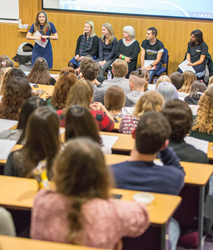 Students heard from former language students working in a wide array of sectors including Nottingham graduates themselves who have gone on to successful positions at The Huffington Post, HM Treasury and Amazon. Speakers shared their experiences and explained how having a foreign language is a big advantage in the working world. Employers highly appreciate language graduates for not only the languages themselves, but for all the skills that come with learning a language, such as adaptability, cultural awareness, critical thinking and communication. Being a language student even allowed one speaker to kick-start her own business, showing that languages are useful in entrepreneurship! What’s more, with media, commercial and public sectors now operating on an international scale, hiring graduates with a second or third language is turning from an option to a must!